ASTI Environmental & Jaffe Raitt Heuer & Weiss, P.C. Learn from seasoned environmental, legal, financial and regulatory experts about how to solve some of the most perplexing environmental obstacles we've faced in decades – Vapor Intrusion & Polyfluoroalkyl Substances (PFAS). 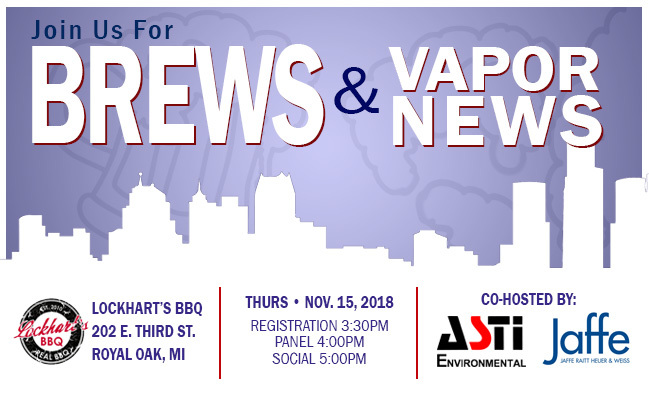 Gain an understanding of how Vapor control is driving site design and renovation, whether to devote more resources to testing or cleanup, what the presumptive remedies are, how the DEQ and EPA are coping with these thorny issues and if PFAS will become our generation's ALAR. Arthur Siegal — Jaffe Raitt Heuer & Weiss, P.C. Registration fee includes all educational materials, 2 drink tickets, and heavy appetizers. Limited seating available, to register in advance please click below. Advance registration will close 11:59 pm, Nov. 14th.